According to the Museum brochure this structure was built in 1933-35 by forcing 1,000s of prisoners to construct it. It’s purpose was to house the NKVD (People’s Commissariat for Internal Affairs), it was an imposing structure of Greek Roman style columns surrounded by little houses in a simple farming village. This two story building was meant to look threatening to the prisoners but inspire grand feelings in those who did the repressing of “Enemies of the People.” By 1961 the agricultural training college was placed there and then it was turned into a sanatorium for children called “Brigantina” from 1971 to the early 1990s. 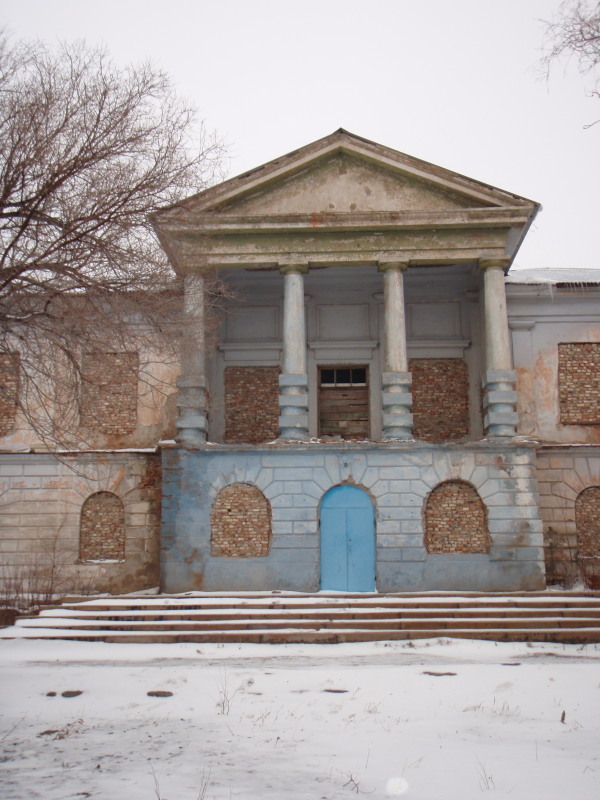 It was planned to be changed into a rest house for miners but after the bankruptcy of that enterprise, the windows were bricked up and it sits waiting to be rehabilitated. 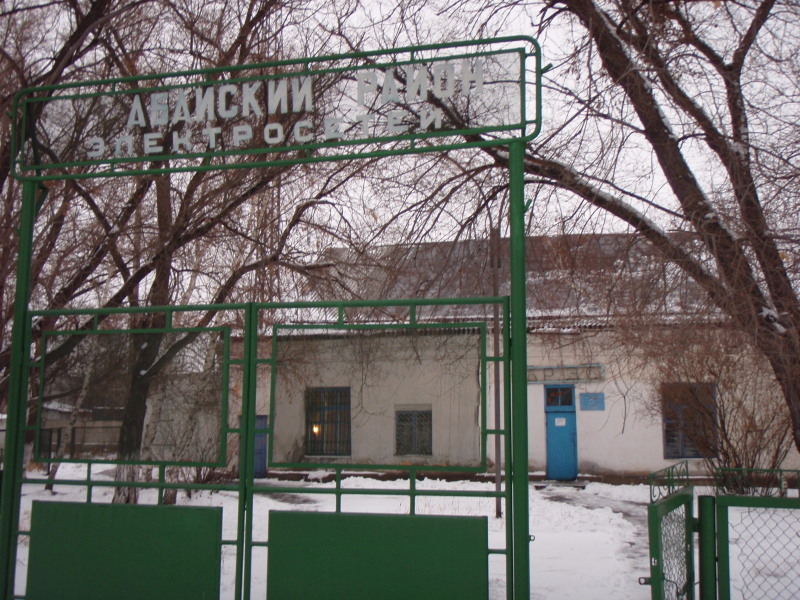 As of 2005, the building will hopefully have a new life once the Museum of Memory of Political Repression find enough funds to restore it. This was the mess hall or dining room for all the officers and higher ups. 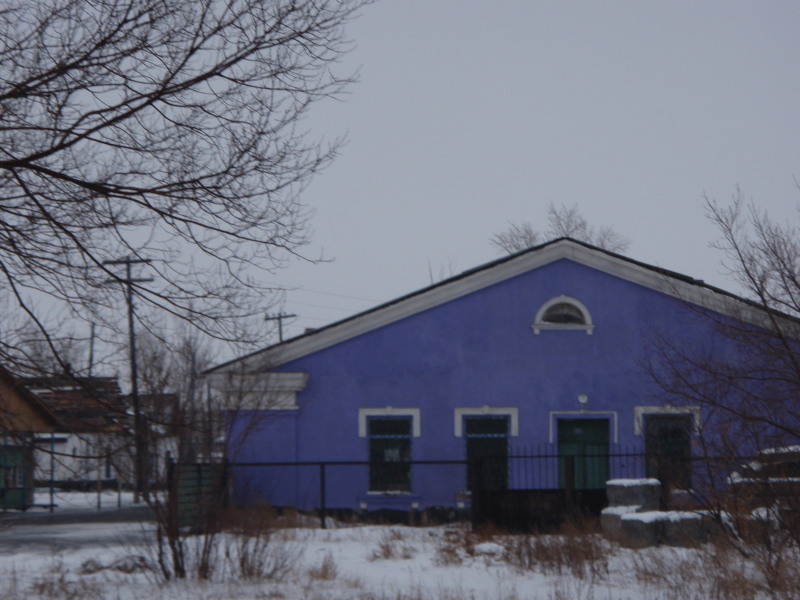 Now a shopping place for those who dwell in Dolinka and was painted purple a year ago. An unusual color in a place so bleak. Either called the “House of Technics” or “Technology House” was built in 1943. The leadership of GULAG (Main Administration for Corrective Labor Camps) tried to show that prisoners could work very well. Therefore, the kolkhoz was called Gigant took part in All-Union exhibition every year. In 1938 the experimental agricultural station was set up here. This building now houses the Abay district electric nets since 1974. Kristina, I have put up a post on my blog linking to all your posts on Karlag. I also added some additional background information. In particular I have some information on Russian-Germans sent there as part of the labor army.